There sure is a lot of talk about bees lately. There are articles in the paper, news reports and documentaries. People are starting to get worried as they realize that if we want food, we need pollinators. 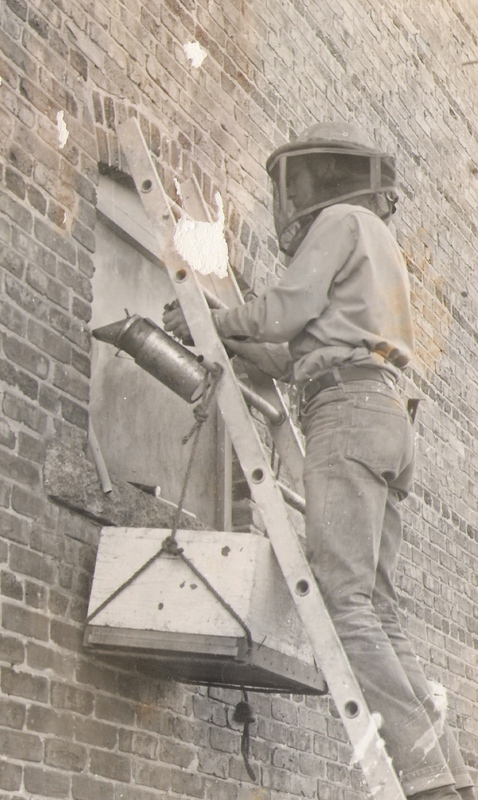 The bee is in trouble, and talk around town is that we better do something about it. What can we do? How do we save the bee? Well, some people say we need to plant large tracts of native wild flowers. As human development in the form of farming and settlements increases, we are effectively removing much of the bees’ food source. The USDA is trying to entice farmers to turn over some of their farm land to wildflowers by offering subsidies. Hm…that sounds familiar…farm subsidies. Some people point their fingers at our farmers blaming them for pesticide use while Colony Collapse Disorder has many baffled. I certainly don’t have the answer, in fact, I know nothing, but I love food and honey, so I have some bees. 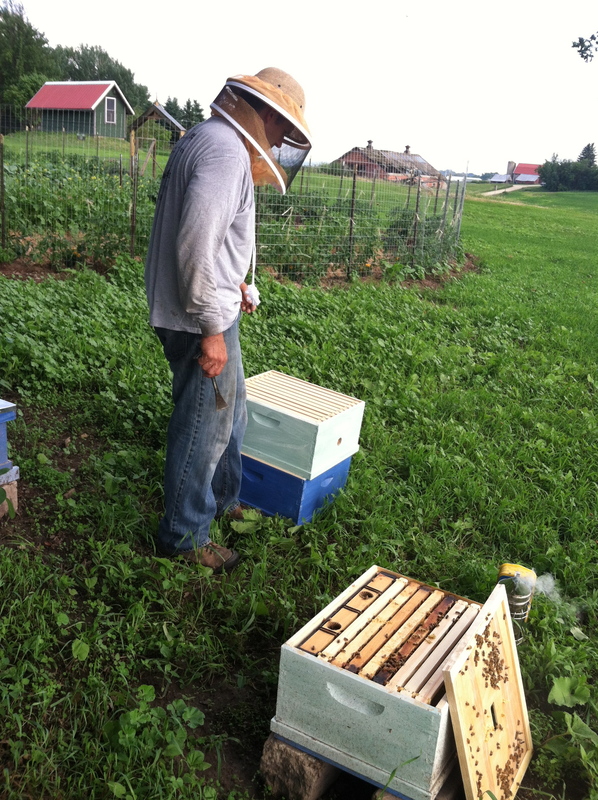 I likely wouldn’t have bees if my dad wasn’t a beekeeper and my husband a willing apprentice. I likely wouldn’t have bees if I didn’t have the farm (although I do have a city neighbor I would enjoy irritating with bees! ), and I likely wouldn’t have bees if I hadn’t started making my honey balsamic dressing. Since Jeff and I started eating this stuff, we eat at least a quart of honey a month. 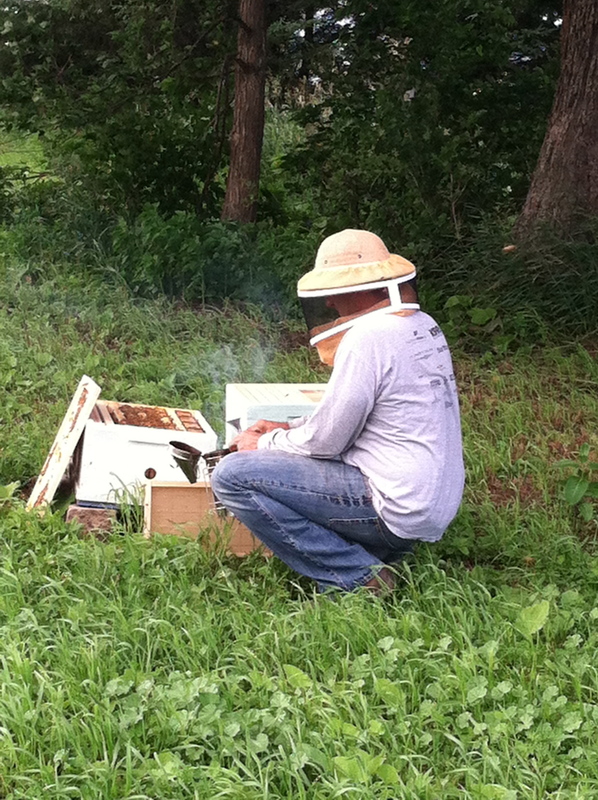 We have two colonies of very beautiful bees, and yesterday was the day that Jeff decided to add a second layer to the new colonies. 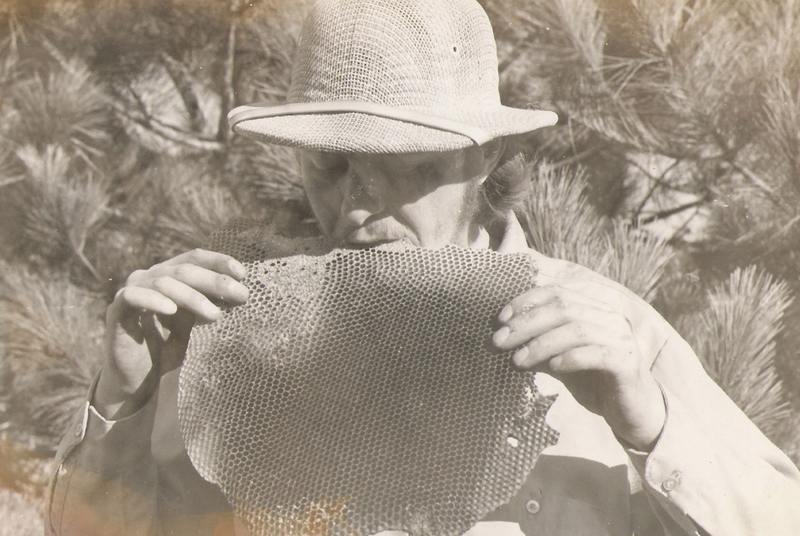 My dad delivered the bees in early May and at that time, the colonies were set up with four old frames, or foundations, that already had honey built up, and we added a number of new wax frames so the bees could go to work building brood comb to make babies. They have been busy! They almost filled all the frames, so we knew they were close to outgrowing their hive. 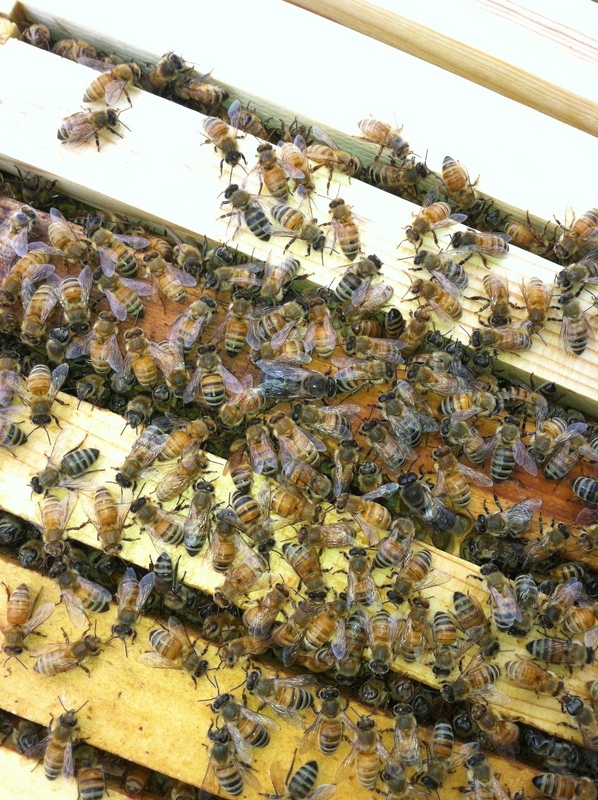 In fact, I told Jeff last Thursday that while feeding the bees I had seen both queens. 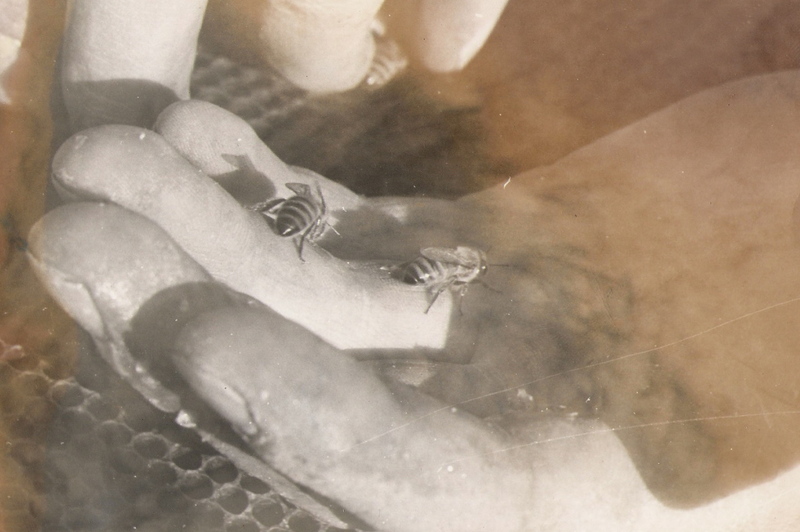 He got worried thinking that her presence on the top of the hive may indicate the need to move – or swarm! Fortunately we didn’t need to do any on-the-job-training catching a swarm and getting it back home! So, with the smoker all set, the new frames ready to go and the colony open for business, Jeff took a deep thoughtful breath and jumped in! 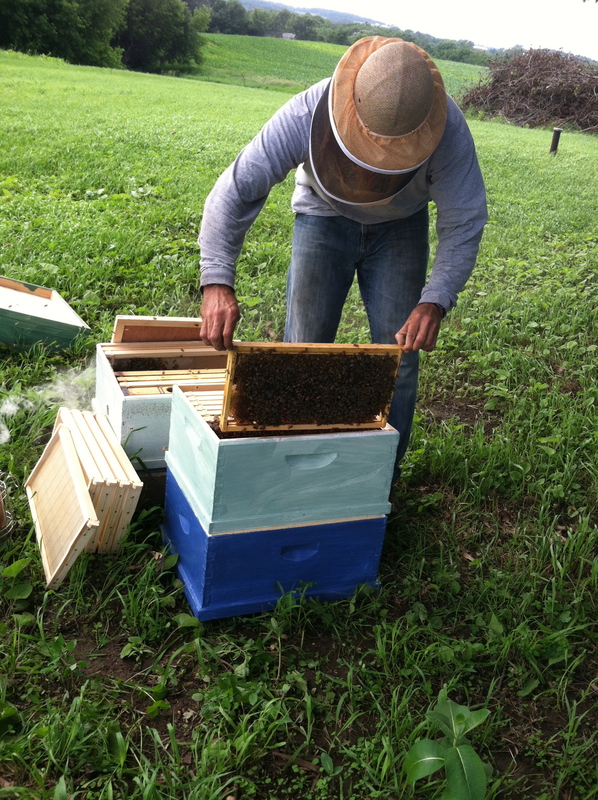 In the picture below, notice the new frames leaning up against the hive. 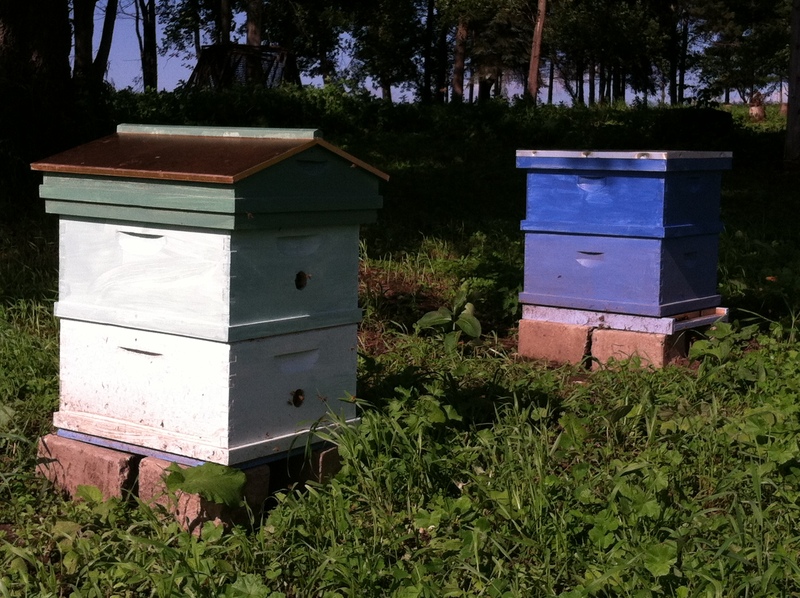 The first hive was divided into both boxes and then new frames were added to fill the two boxes. Right as Jeff was tending the bees, the farmer neighbor came through with fertilizer! We can do our part to have bees and grow masses of wildflowers, but it’s going to take some major economic restructuring to convince the corn-growers to change their ways. And, someday our bee yard won’t be a patch of weeds! That project is on the docket queuing up!